Finally, after much delay with Royal Mail my PADI Open Water Diver pack arrived. 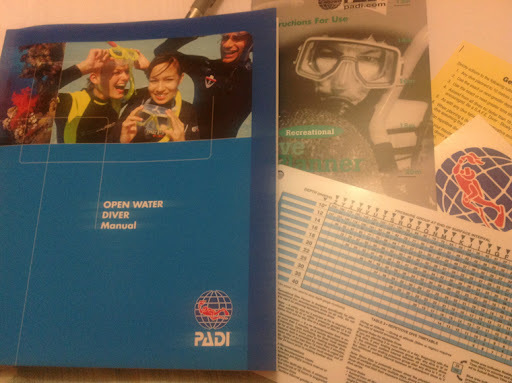 LSD sent me a pack including details of my Open Water Referral course this weekend over in Chiswick, a recreational dive planner instruction book and plastic table (what the heck are all those numbers?!) and of the manual with cheesy photos and references to "videos"... ah the halcyon days! The manual is very colourful and although simple to follow there's so much to remeber that it keeps you interested and prepares you for what exercises you complete in the confined dives. The idea is that you read through the manual before attending the training sessions, and within the manual it gets you to highlight the answers to certain questions, take mini quizzes and mark your answers and then complete 5 chapter tests to discuss with the instructor in class.